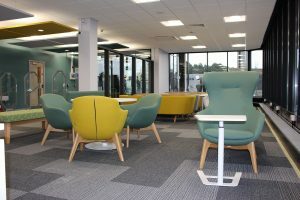 Following on from a successful launch we are delighted to see the newly refurbished Hugh Owen Library Level D in full use. Our Group Study Rooms are busy and the library floor is full of students revising hard for their exams. The space was officially reopened by our Vice-Chancellor, Professor Elizabeth Treasure on Monday January the 8th. You can read about the launch here. 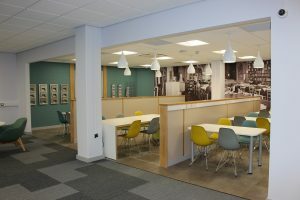 We have an album of photos of the new space on Flickr. Please continue to give us your feedback on your new space. 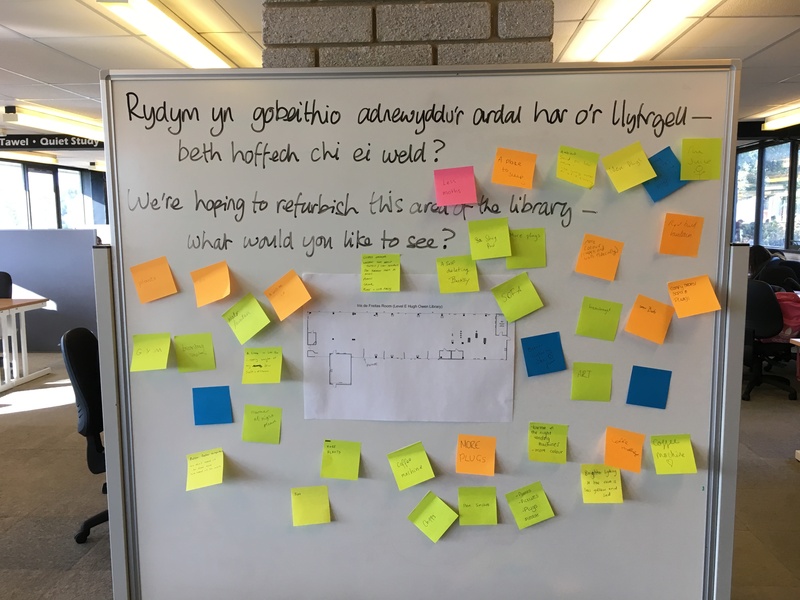 Post on our feedback wall on Level D of the library or email tellusnow-is@aber.ac.uk. Thank you to everyone who fed their ideas into the design of the new space. We believe you can see that your feedback and ideas impacted upon the refurbishment. On behalf of the staff in Information Services, we wish all our students who are sitting exams the very best of luck. 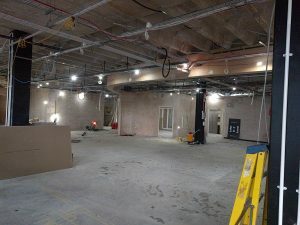 You may have noticed a flurry of activity out the back of the Hugh Owen building this week. 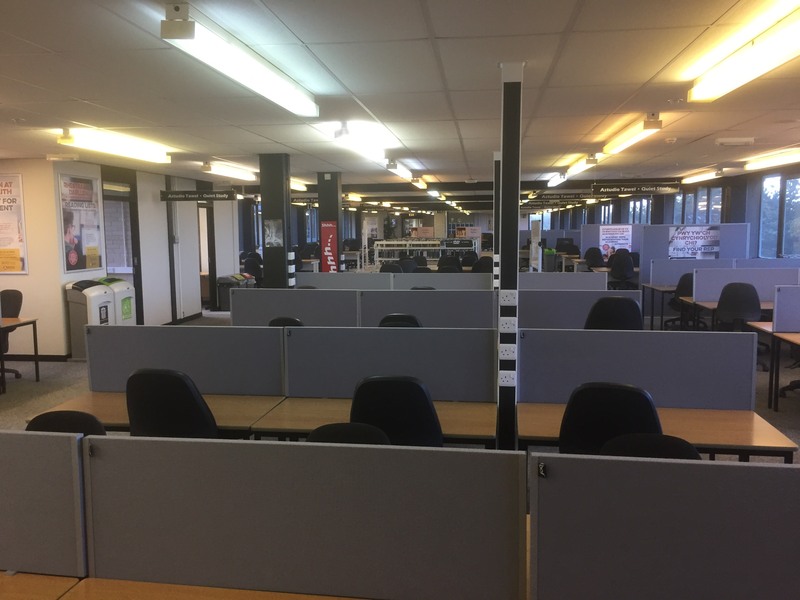 We have taken delivery of the furniture and the newly refurbished space is really beginning to take shape. This is an 88% increase in study spaces for you on Level D.
A vending area for you to enjoy hot and cold drinks and cold snacks. 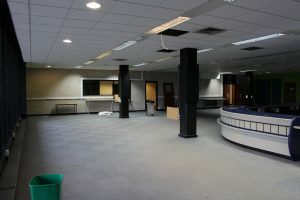 This space will also be complimented with a vending machine for supplies of stationery. Brand new gender neutral facilities on Level D.
Brand new disabled facilities, which in addition to the work the University has undertaken on the Piazza now makes Level D far more accessible. 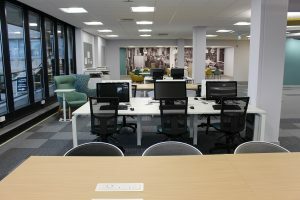 Two new Group Study Rooms for up to six users and includes high spec PCs and large screen monitors. We have improved ventilation, heating and lighting replacing dated systems with more energy-efficient modern systems, which saves both money and the environment as well as creating a more pleasant working environment for both students and the staff who work on Level D.
A reminder that we re-open Level D again on Wednesday January 3rd at 8:30am.. We hope to see you then and look forward to hearing your feedback on this space. Updates! 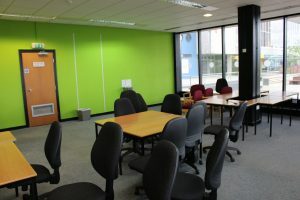 Group study room and gender neutral toilets. •	and the gender neutral toilets at the bottom of the stairs. We would like to apologise once again for any noise disruption. As we mentioned in our previous blog posts, this will soon become less of an issue. •	Come to celebrate Level D reopening on 3 January 2018! Come to celebrate Level D reopening on 3 January 2018! •	The first lamps are being installed here. •	The refreshment area is looking good! We know that during the past few weeks the library was not as quiet as it usually is. Your patience and understanding will be rewarded with cake for all who come to celebrate Level D reopening on Wednesday 3 January 2018. A small formal opening by the Vice-Chancellor will take place around a week later. We will come back soon with new updates and photos. 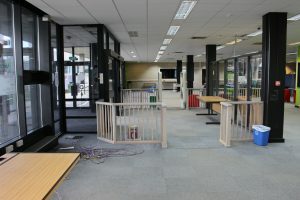 Welcome to new students and welcome back to returning students who may be suprised to find that the original library entrance on Level D is not open and that there is a temporary entrance to the Hugh Owen Library via Level E. This is due to building work taking place over summer and continuing through this first term to refurbish Level D. A reminder of why the Hugh Owen Library Level D is being refurbished. 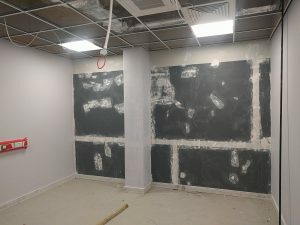 Refurbished Level D is really starting to take shape with old office walls having been removed and new walls up and plastered, making new areas. 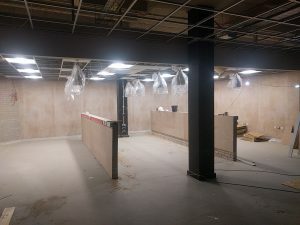 The photos below have been taken just before the start of term, and show the new group study spaces, new Enquiry Desk area and the space leading down towards the stairs up to Level E of the library. 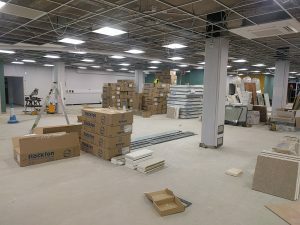 We are very excited to see so much progress and look forward to new furniture arriving in November and seeing the space in full use in January 2018. We are currently in week 10 of building works. •	Mechanical and Electrical isolation/strip out is 100% complete. 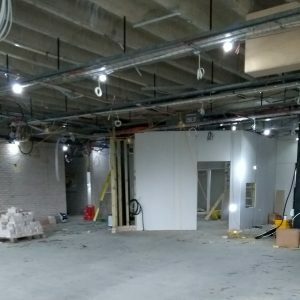 •	Plumbing and Mechanical 1st fix is in progress. 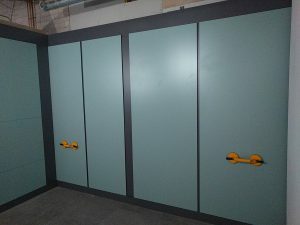 •	Internal partitions are all boarded on one side. 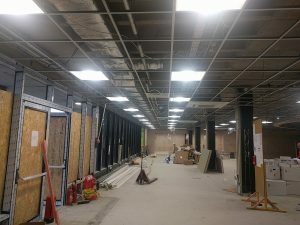 •	Our suspended ceiling grid is due to be installed next week. 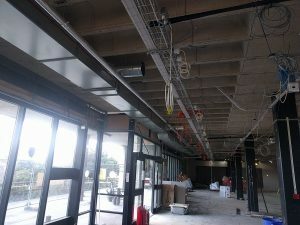 •	Work continues on the ventilation system. 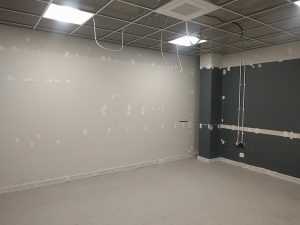 This new ventilation system will result in a more pleasant working environment for staff and students on Level D.
The main thing we are working on this week with our electricians and mechanical engineers, is the position of our new furniture. Following on from regular student feedback, we are endeavoring to ensure we have as many plug and USB points as is reasonable in our new space to enable you to charge your devices. View from old entrance. 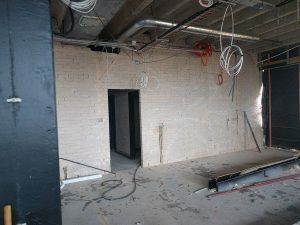 Door on left of photo leads to stairs. Current view. We have also had very successful meetings with our colleagues in the Design Studio. Again, following on from student feedback, we are hoping to have some very beautiful murals and wallpaper in our new look Level D.
•	Set up and enabling works are completed. 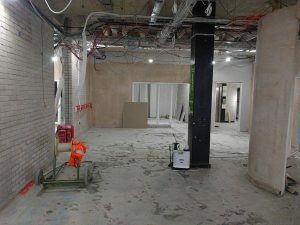 •	The contractors are at the end of the soft strip out and demolition phase. 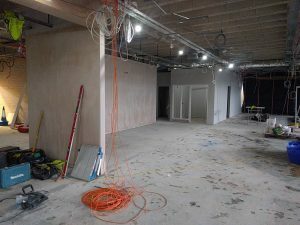 •	The electrical strip out has begun and the first fix is underway. •	The mechanical strip out is due to begin imminently. •	A new mains board has been installed. We also discussed things like door locks, ceiling tiles and carpet tiles. This week there will be work happening on the air handling unit and the plumbing system. 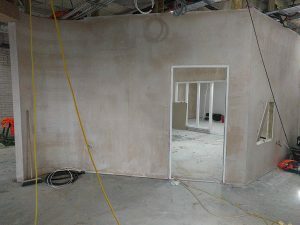 We are hoping to have more photos of the progress up soon.